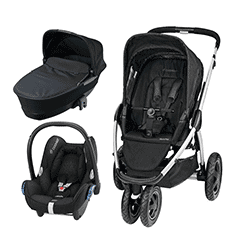 The Quinny travel system has been designed with your urban lifestyle in mind. 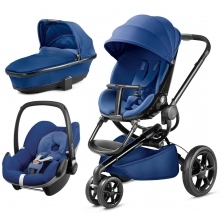 From busy city streets to crammed buses, this pram can tackle every obstacle with ease, finesse and, not to mention, style. 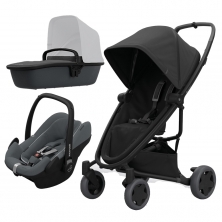 The Quinny 3 in 1 can be used from birth, and includes a foldable carrycot, which is perfect for your newborn’s first foray into the big wide world, giving them a comfortable and secure journey in the perfect lying position. 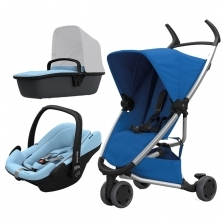 The pushchair is compatible with any Maxi-Cosi baby car seat so you can take your baby from the car to the pram easily, without needing to wake them up. Once your child is old enough, the pram can be converted to a comfy, upright seat, which can either be parent facing, allowing you to see your child as you walk, or outward facing, so they can explore the world as you travel. 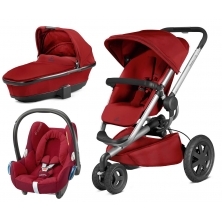 The seat can also be reclined so your little one can sleep as you stroll. There is a sun canopy, to protect little eyes from the blaring sun, as well as a large shopping bag that can hold up to 5 kg. The Quinny really is the perfect urban travel companion!